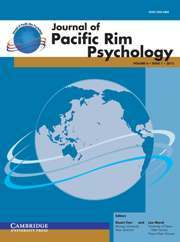 Journal of Pacific Rim Psychology is devoted to advancing psychological science by providing an international platform for timely dissemination of important research ideas and findings. Although the title of the journal mentions the Pacific Rim, it aims also to go beyond this regional focus, and publish high quality articles that address issues that challenge contemporary societies. The journal seeks to foster mutual capacity-building among the Pacific Rim regions in the research domain, and also to engage with North American and European perspectives. It is a general-interest journal that publishes articles demonstrating scientific excellence across the entire spectrum of psychological science. The journal publishes in fields including cognitive, social, developmental, educational, industrial, organizational, and health psychology, as well as cognitive neuroscience, and other related topics. The journal welcomes submissions, including empirical research articles, short reports, reviews, meta-analysis, replication and commentary, from any part of the world. Toward a cultural psychology of collective action: Just how “core” are the core motivations for collective action?